SALE FELL THROUGH, BACK ON THE MARKET ! 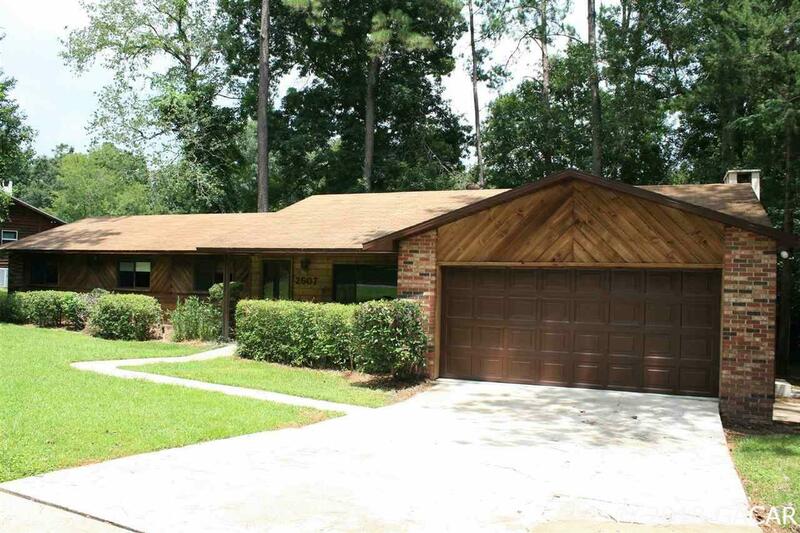 This lovely 4 bedroom/2 bath concrete block home has just been painted on the outside. The cedar paneled front was pressure washed then sealed at the same time. The spacious family room has a wood burning fire place with glass screen. From this room, through glass sliding doors, one can step out onto the deck. The deck was just pressure washed, re-stained and sealed. The open kitchen, with eating bar, is between the family room and the dining room. The dining room has beautiful tile floors, candle lite chandelier and sheer full length drapes covering the windows that look out onto the back yard. The same tile is in the entry way. Both the master and hall bathrooms have tile floors. The rest of the rooms and hall are carpeted. The hall bathroom has a new large sink cabinet with a solid beautiful top. The master bathroom also has a new white sink cabinet and white wall cabinet over the toilet. Both bathrooms have full length mirrors with lights above them. The back yard has large shade trees plus full grown plants around the around the periphery providing privacy. The home is located near Santa Fe College.